Well, now that you're probably wondering whether Amano Foods sent us a big check to write last week's article (ahaha, that's a good one: making money from blogging), we've got another food tip for you. The problem I run into, though, is that I'm not familiar with a lot of the greens commonly sold here. 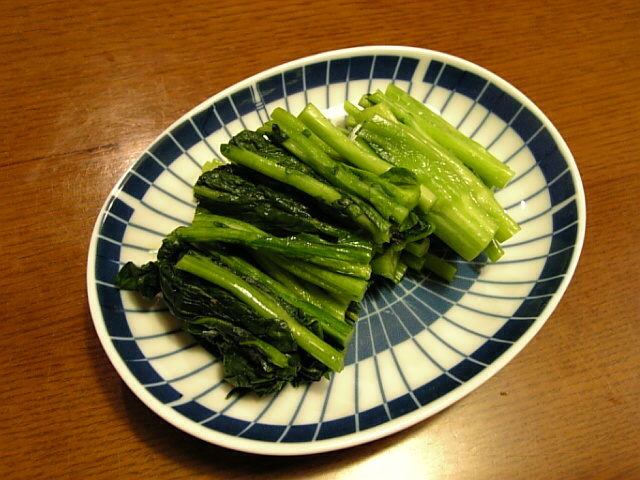 Sure, I can recognize cabbage (キャベツ), lettuce (レタス), spinach (ほうれん草)--which when you eat raw will bring bug-eyed stares from Japanese people--and even "Chinese cabbage" (白菜), but there are a lot of other greens on the local supermarket shelf that weren't common for me back home. 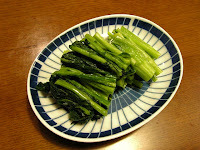 Today I'll introduce one that's easy to use, cheap, and grown domestically year-round: Mizuna (水菜). When I first tried this stuff at a restaurant, I actually thought it was dandelion. When removed from its long white stalk, the leaf shape is vaguely similar... or at least it appears so to a botanically ignorant person like me. The taste of mizuna is mild, though, with little bitterness and a nice fresh crunch that adds some variety to the monotony of lettuce-dominated salads. Aside from salads, it's also good for stir-fries, and you've probably tried some pickled before, though its a bit harder to recognize after its leaves lose their serrated shape. It's usually sold in long plastic bags like the image above, containing several clumps of attached stalks and their leaves. The bags are convenient, as you can just chuck the whole bundle into the fridge where it should stay good and crisp for 4-5 days. When preparing mizuna (for salads, stir-fries, or pickles), you can use the whole thing. 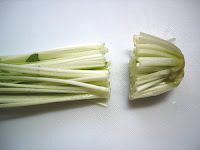 Just cut an inch or so off the bottom so you can separate the stalks.